“Man, this soup is delicious.” That was my better half’s reaction to this soup. I’ve been fighting off a cold, so I was in the mood for soup. This isn’t exactly what I would consider a close cousin to Chicken Noodle Soup, but when you’re sick, it’s a great comforting soup. 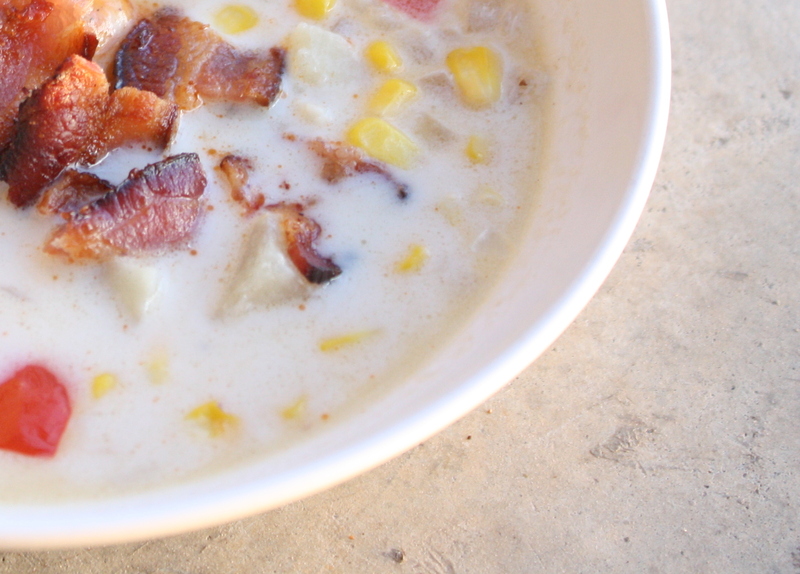 When you’re not sick….it’s just a delicious, tasty soup. To me, it’s a win-win. 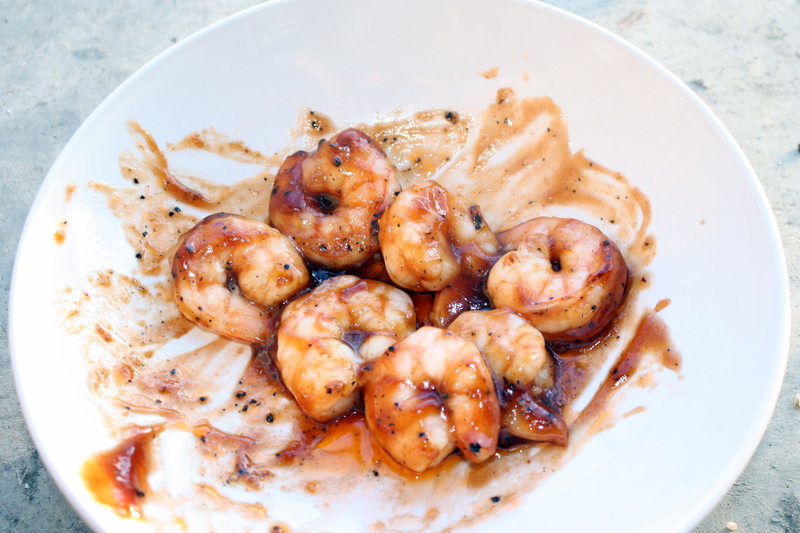 And then there’s barbecued shrimp. I made a major error….I underestimated the amount of shrimp we had on hand. 7 little (jumbo) shrimp. 7. Who left only 7 shrimp in the bag? That might of been me…it may not have been. The jury is still out. 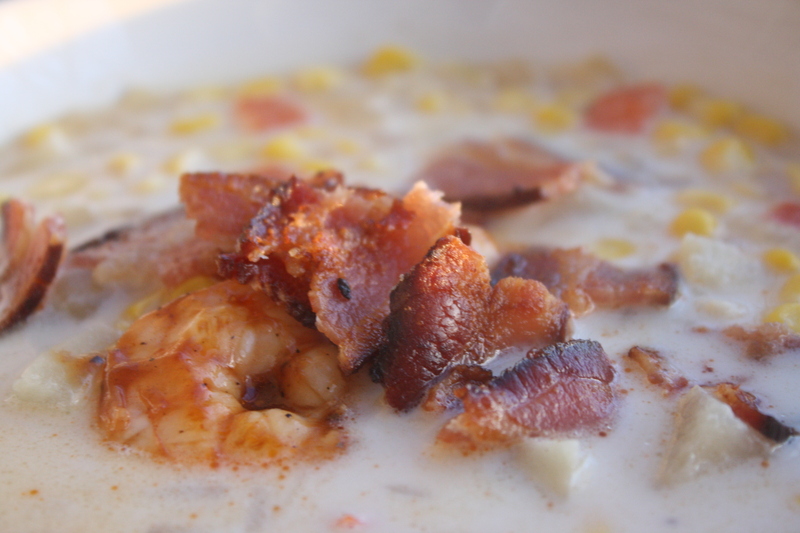 At any rate, some delicious, juicy shrimp, and some nice, crispy apple wood smoked bacon on top….Amazing. Heat a large pot over medium heat. 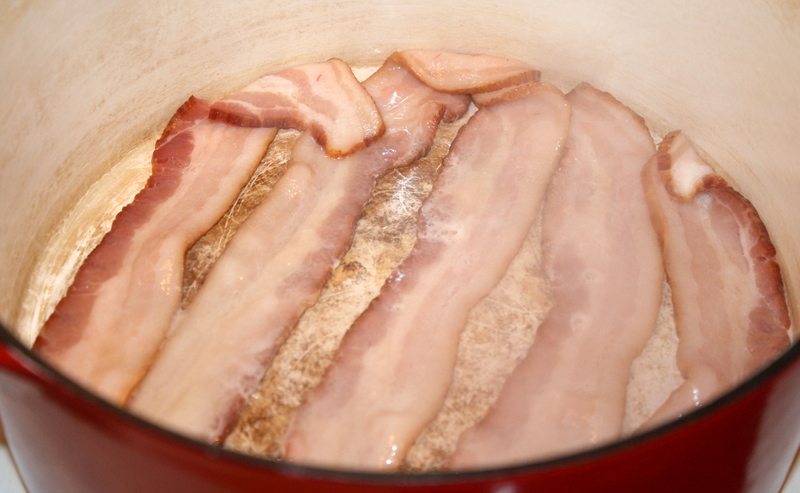 Once hot, add the bacon slices and cook until crispy and golden brown. Remove bacon and let drain on a paper towel. Add onions and peppers to the pot with a sprinkle of salt and pepper and cook for 5 minutes, stirring occasionally. Add garlic and cook for an additional minute. Whisk in the flour, cooking for 1-2 minutes or until flour becomes golden in color and smells a bit nutty. 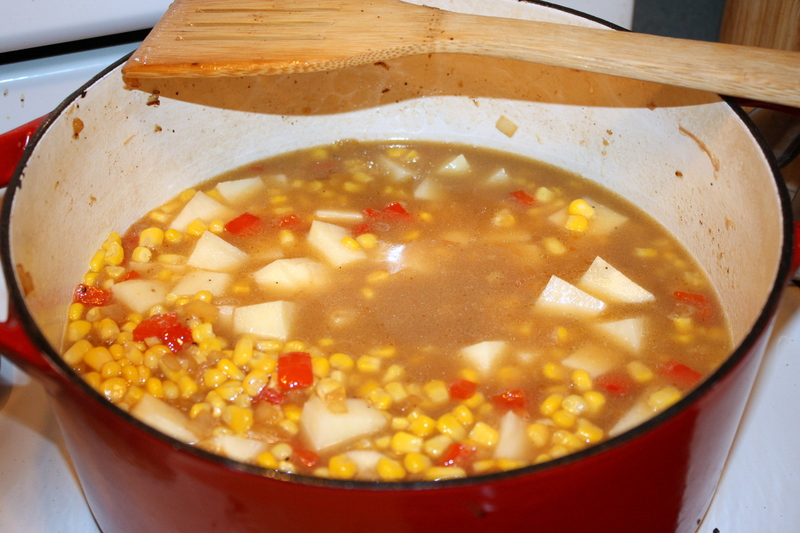 Add chicken stock, potatoes, and corn. Bring to a boil then reduce to a simmer and cook for 10-15 minutes. While soup is simmering (or before or after or whenever is convenient for you), heat your grill on the highest setting. You could also use a saute pan on medium high heat. Season shrimp with salt and pepper, brush with a thin layer or barbecue sauce, then cook for 2-3 minutes per side. Remove from grill and toss with remaining barbecue sauce. 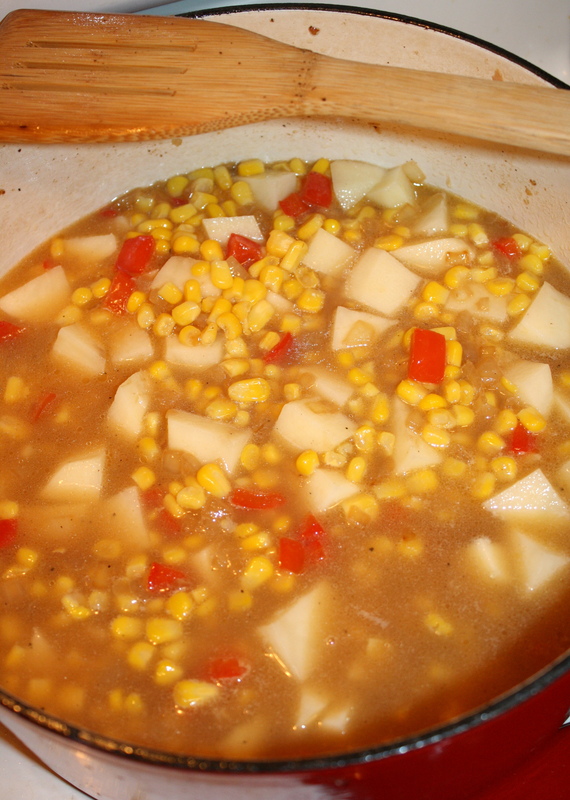 Once soup has slightly thickened and the potatoes have started to break down, stir in milk and cream. Add 1/4 teaspoon of pepper, then season according to your tastes. 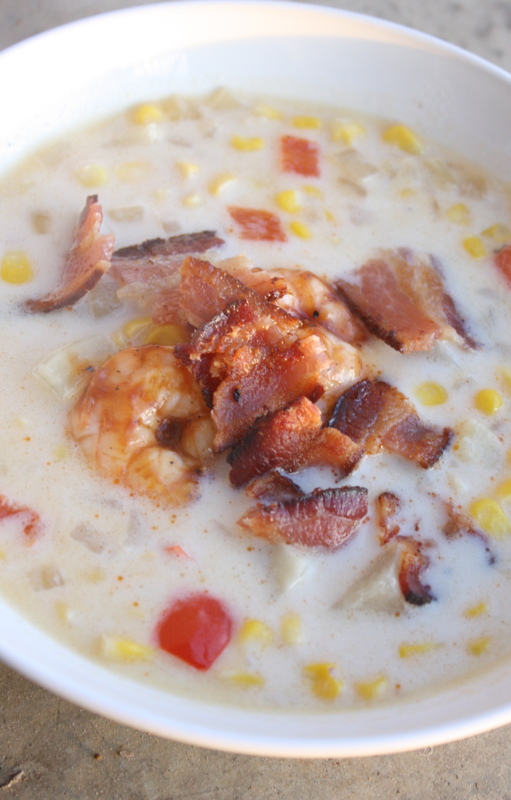 Serve in bowls topped with the crumbled bacon and shrimp. Store leftovers in the fridge for up to one week. Adapted from How Sweet Eats. Originally from Pittsburgh Post-Gazette. There are many things we love in this world. A few of those things include Parmesan cheese, chicken and quinoa. This dish is all of those things! There are two more things we love. Delicious meals and easy meals. This meal is a two-for-one. It is both easy AND delicious. Most people might think of this as a “one pot meal.” However, it’s cooked in the oven, so I like to call it a “one pan meal.” And we paired it with a quinoa. I cannot say enough about how much we love quinoa! We currently have more quinoa than we know what to do with, and I am not upset about that in the slightest. What does that mean to you? More quinoa recipes to come! 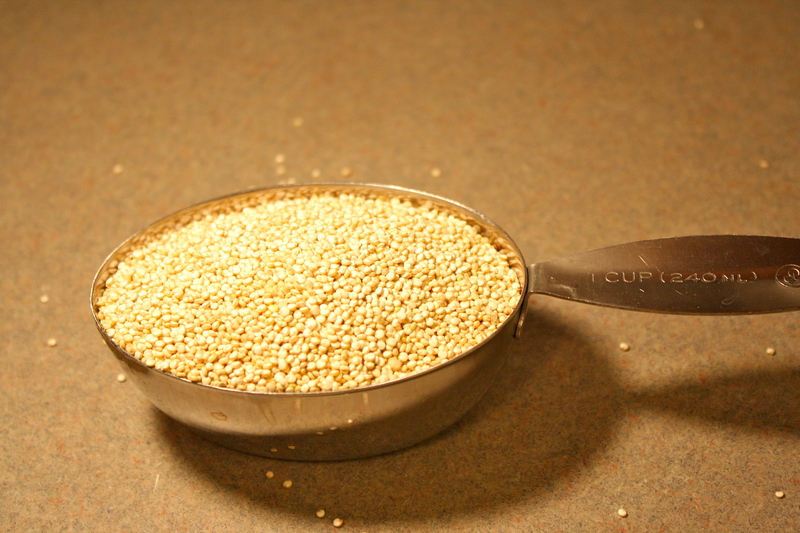 One thing I will say about quinoa….always cook it in chicken broth. Always. It’s still good in water, but the chicken broth adds such a great level of flavor. 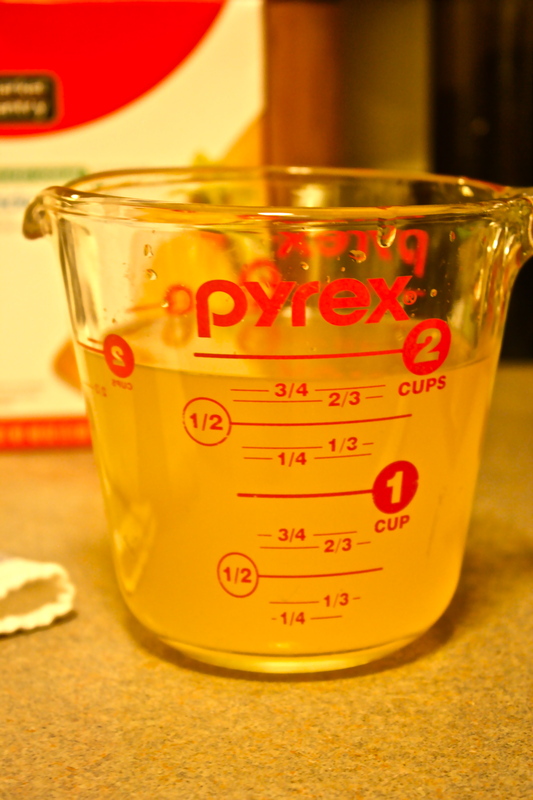 However; if your recipe calls for water and salt, pare back on the salt, the chicken broth will provide its own salt. 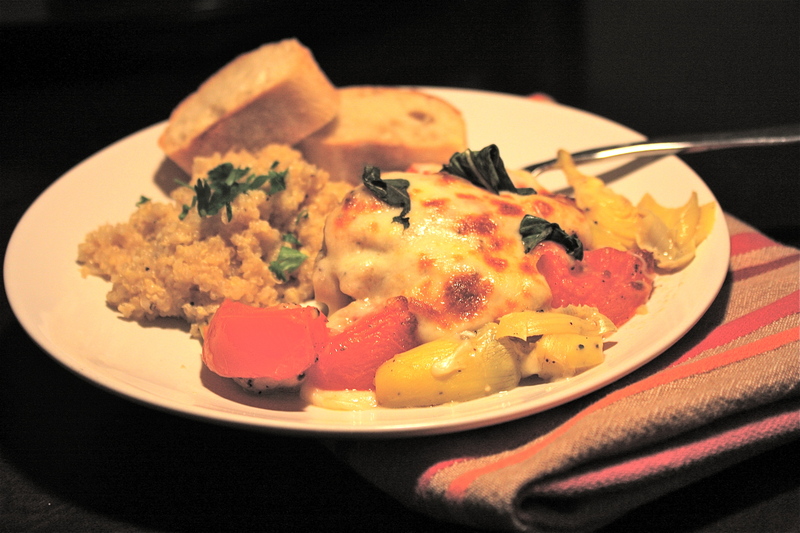 We paired this easy Italian Chicken Bake with Creamy Parmesan Quinoa, and it was amazing! We hope you enjoy it as well! Core and chop Roma tomatoes. 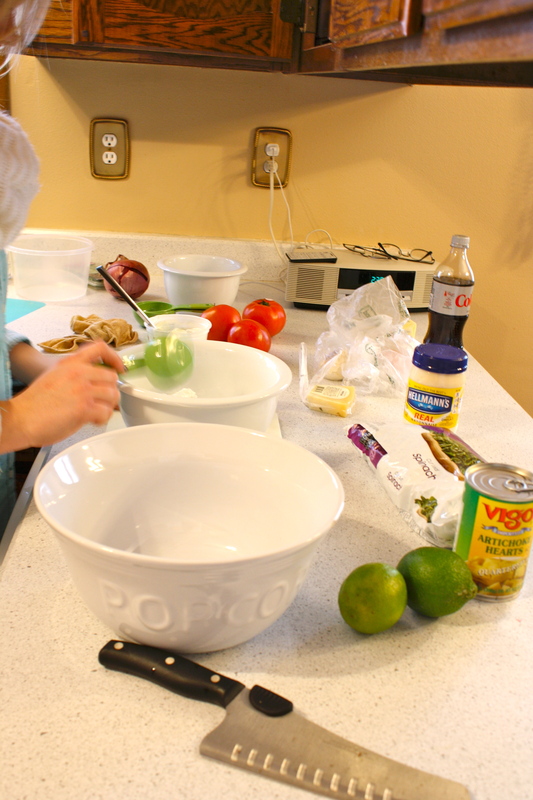 Place tomatoes, artichoke hearts, salt & pepper (to taste), sugar and flour in a large bowl. Mix. 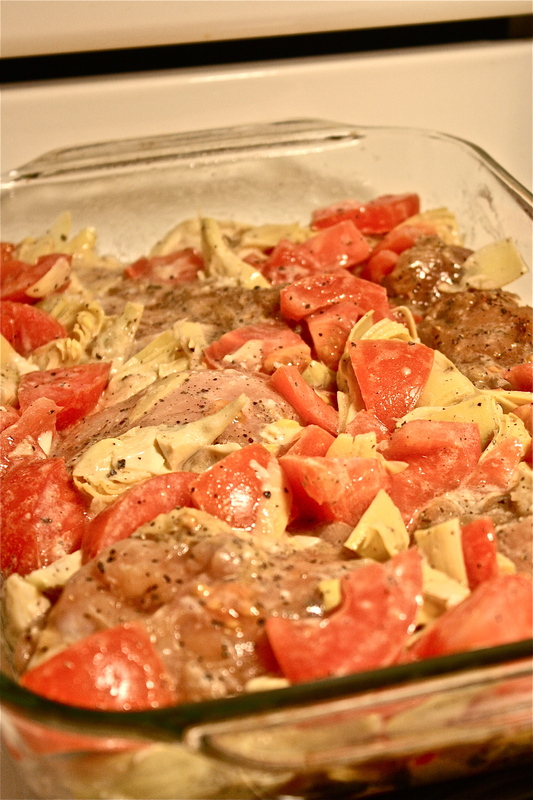 Place the tomato mixture in a 9×13 pan, and place the chicken breasts on top of the mixture. Place in a 350 degree oven, and cook until done; about 35 minutes; or until chicken is almost done; about 160 degrees. 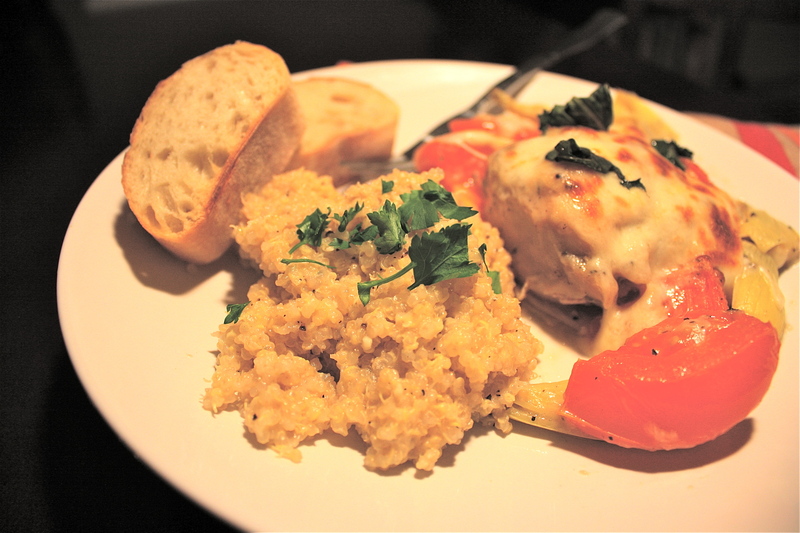 Top each chicken breast with mozzarella cheese. Place under the broiler for a few minutes until the cheese is melted and vegetables are caramelized. 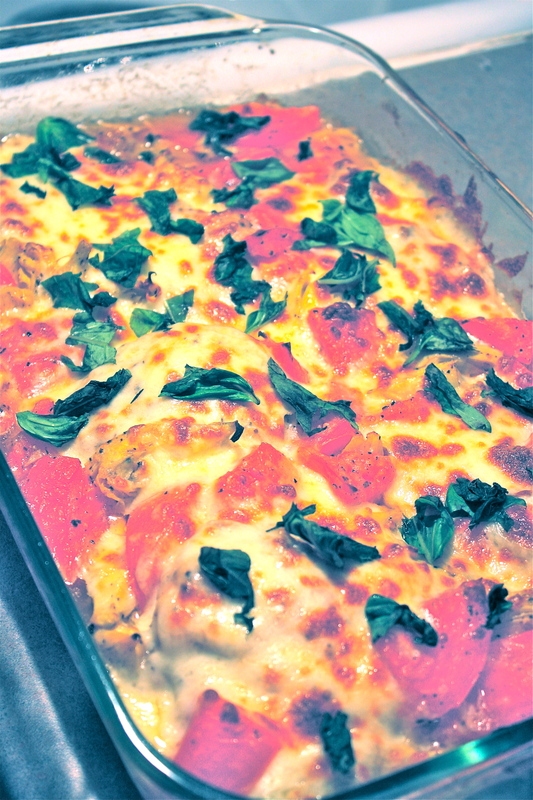 When cheese is melted, pull from the oven and sprinkle with chopped fresh basil. This can be served as is, or over pasta. Adapted from Aaron & Jill. Heat extra virgin olive oil in a small saucepan over medium heat then add garlic and saute until barely golden brown, stirring constantly (watch closely as it can go from golden brown to burnt very quickly!). Add quinoa then toast for 1 minute, stirring frequently. Add chicken broth then turn heat up to high and bring to a boil. Place a lid on top then turn heat down to medium-low and cook until nearly all the liquid has been absorbed and quinoa is tender, about 15 minutes. 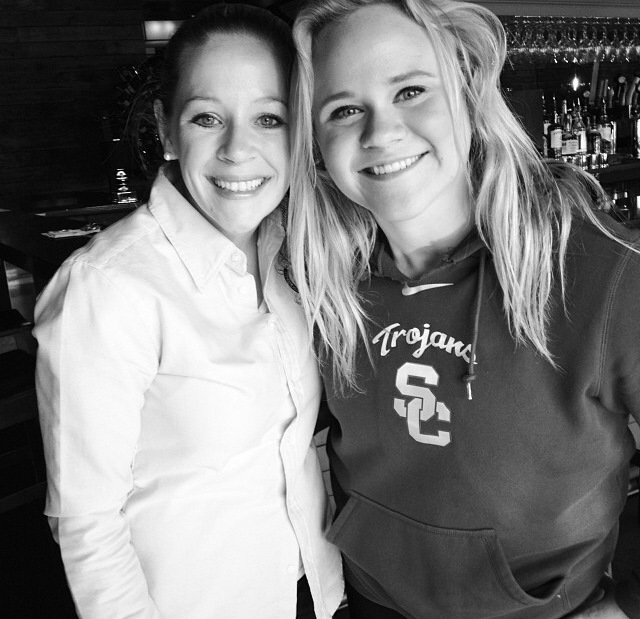 I cannot take full credit for this post…my cousin Gwen was actually the chef on this one; however it is a favorite recipe of mine that I passed on to her. For those who may not know; Bucky and I became engaged a little over a month ago. This past weekend, we went to my hometown for the first time since being engaged, any my parents threw an “unofficial” engagement party, if you will. 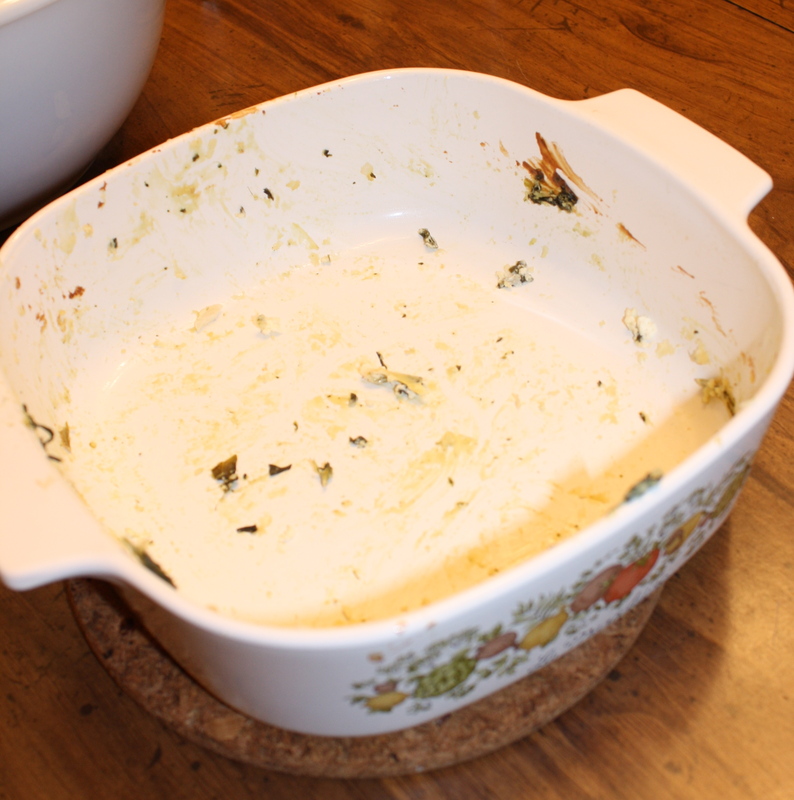 That being said, I requested Gwen make the Spinach Artichoke Dip. 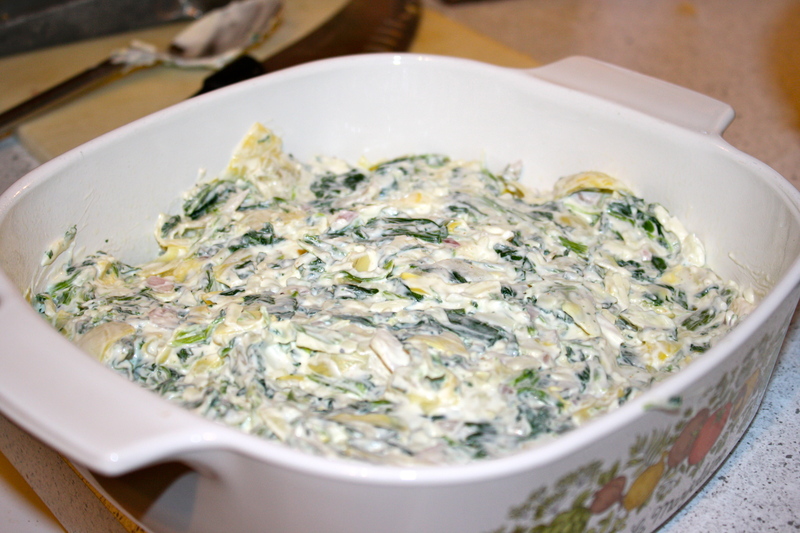 Who can’t get excited about cream cheese, parmesan cheese, spinach and artichokes? All of those are things I love. Mix them all together, bake them, add tortilla chips….and I’m all over that. This dip is pretty much amazing. This dip could most definitely be served with something healthy, like carrots, celery, radish slices, etc. However, I prefer tortilla or pita chips. With something so indulgent; I don’t mess around with healthy dippers. What I also love about this dish is that it’s so simple….Mix together and press into a baking dish….and bake. Then eat copious amounts of this. Who could disagree with this. 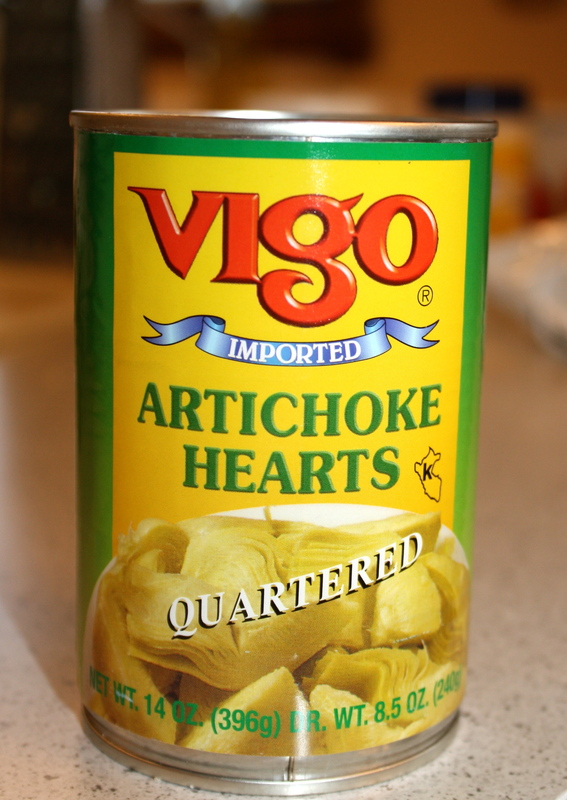 People who don’t like spinach and/or artichokes could disagree. But I don’t care to associate with people who don’t like spinach or artichokes…just kidding (kind of). 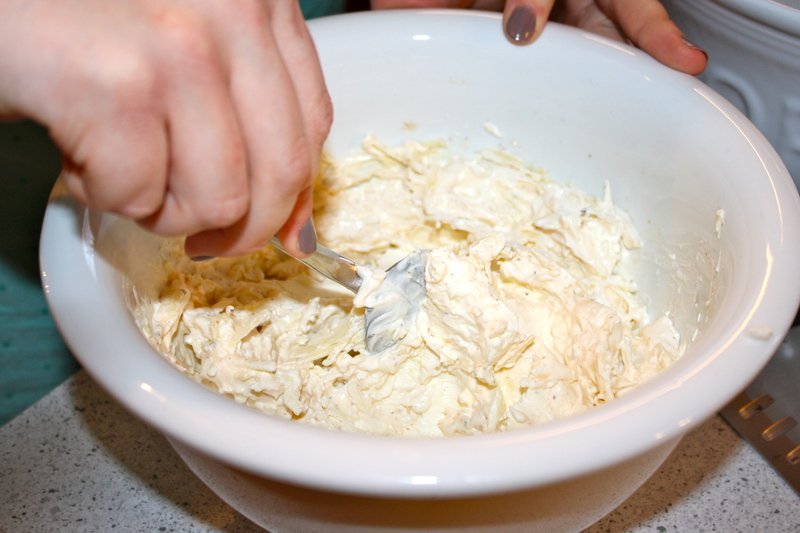 In a large bowl, combine cream cheese, sour cream, mayo, and 3 tbsp. of the parm-style topping. Add the salt and cayenne pepper, and then stir until smooth. In a pan sprayed with nonstick spray, cook the shallots and garlic over medium heat until soft (1 – 2 minutes). Set aside. To the large bowl, add spinach, artichoke hearts and garlic/shallot mixture. Stir well. Transfer to a casserole dish, top with the remaining parm, and then bake for 30 minutes (or until bubbly). I meant to take an “after” shot post-baking; but I couldn’t get a shot before it was eaten in full…..
Who doesn’t love a good cupcake? They’re definitely super trendy right now – as demonstrated by all of the boutique cupcake bakeries popping up. At any rate, we are huge fans of cupcakes. Snickers Cupcakes, Cookie Dough Cupcakes, Mint Chocolate Cupcakes top my list. 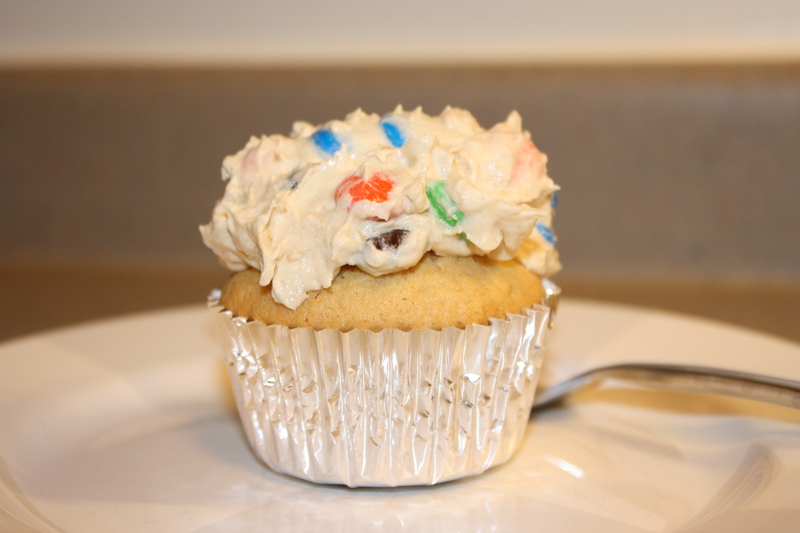 But I may have a new favorite….these Monster Cookie Cupcakes. I grew up on my mom’s monster cookies. Mind you; my mom always (and still does) made sure that we ate healthy meals. But; she also has a sweet tooth. She will wake up a 2am and go down to the kitchen and eat half a cookie; or cut a small sliver from a full pan of bars, brownies, cake; etc. That being said, she would once in a while argue that a monster cookie; with all the oatmeal and peanut butter was a “healthy breakfast.” Those were great breakfasts. They contain peanut butter; I LOVE peanut butter. You know the old wive’s tale that eating peanut butter will cure hiccups? When I have hiccups, my go-to is peanut butter. I’ve been accused of just eating it, with no care of what happen to my hiccups. I plead the fifth…. Use a hand or stand mixer to whisk together all of the cupcake ingredients except for the chocolate chips. Then, stir in the chocolate chips with a spoon or spatula. Fill each cupcake liner about 2/3 full of batter. Bake for 20 minutes or until toothpick inserted comes out clean. Let cool on a wire rack. 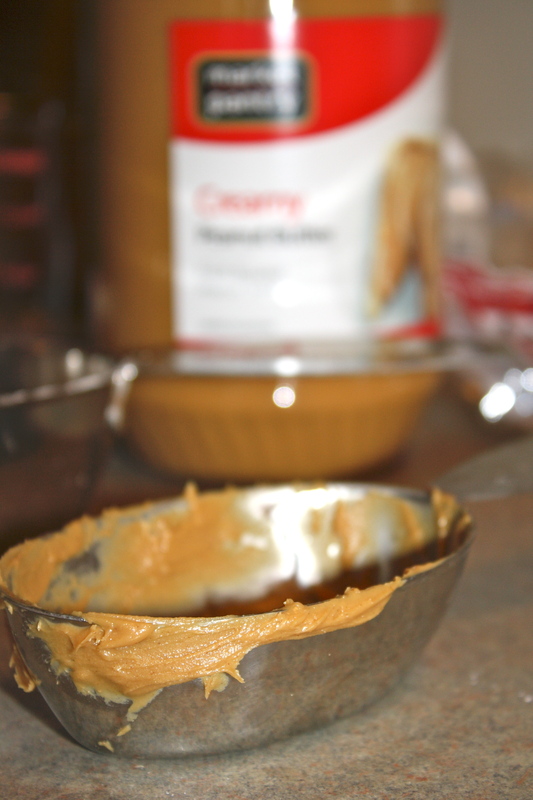 Meanwhile, use a stand mixer dough paddle to beat together the cream cheese, butter, and peanut butter until smooth. Mix in the brown sugar, flour, vanilla, and oats. Mix in the powdered sugar 1 cup at a time (1 and 1/2 cups worked out best for me). 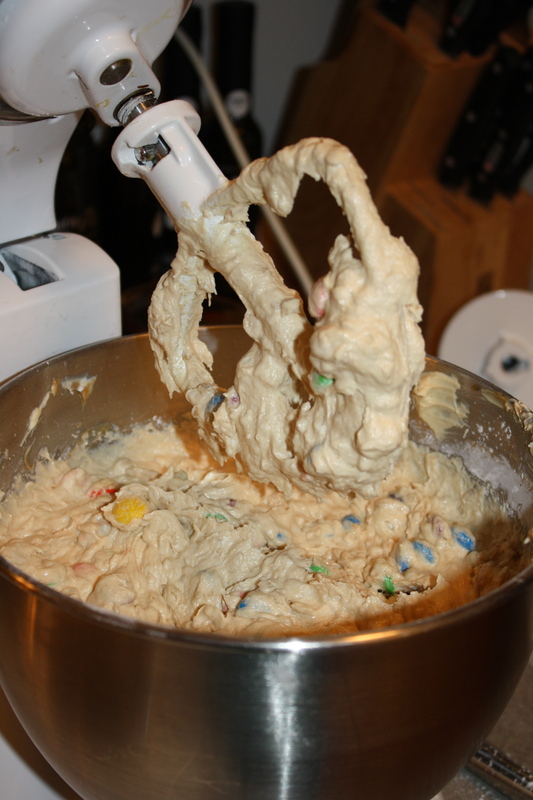 Finally add the M&Ms and Chocolate chips, mix well. Use a large cookie scoop or ice cream scoop to scoop out the cookie dough onto the completely cooled cupcakes. I do have to warn you – I doubled both the cupcake and frosting recipes to make 24 cupcakes; and I had an ample amount of frosting left. 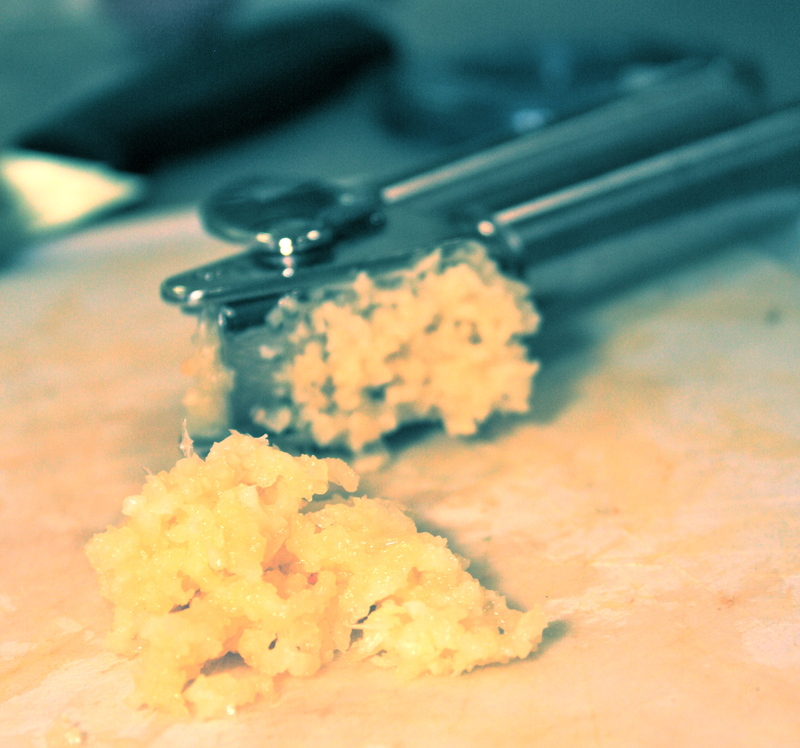 You could likely double the cupcake batter, and use the one recipe of frosting. Enjoy! I love Mexican food. It’s one food I could eat over and over again. If calories didn’t count, I would probably eat chips and salsa at every meal. Unfortunately, calories do count, and therefore we’re always looking for healthier versions of our favorite meals. Enter these Ancho Chile Tacos! Don’t get me wrong, I love a good enchilada topped in red sauce with melted cheese on top; but I also love a good “fresh” taco. This is just that! These tacos do require a few steps, but let’s get started with the chicken first. 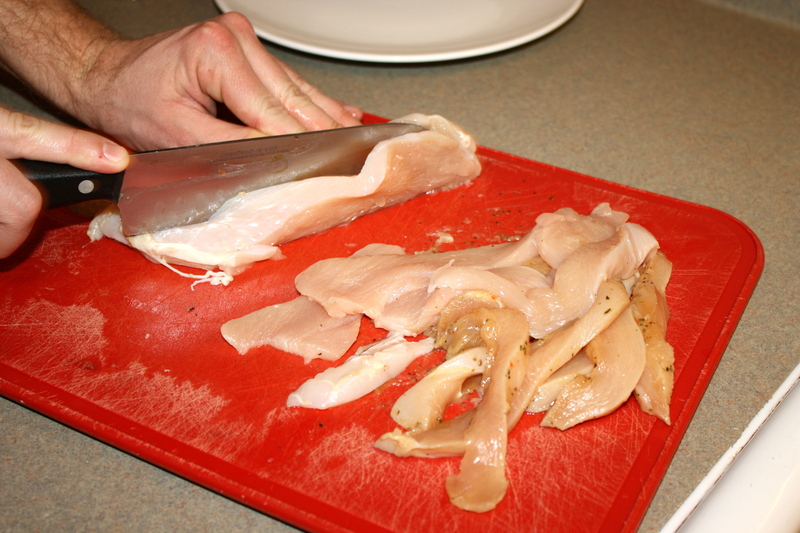 Begin by slicing your chicken into 1/4 in strips (give or take). Then, toss the chicken with the ground chipotle peppers, garlic salt, and cumin. It may not appear to be delicious at this point, but bear with me, they’ll be quite delicious! Let this “marinate” for a few minutes, and then heat a large skillet over high heat. Coat the pan with cooking spray. Add chicken to pan; cook 4 minutes, stirring frequently. Remove chicken from pan. Tent with foil to keep warm until ready to serve. Next, let’s make the Cilantro Slaw! In a bowl, combine 1 tablespoon juice, cole slaw mix, green onions, cilantro, canola oil and salt. Toss to coat. Finally, we’ll prep the Avocado Cream. 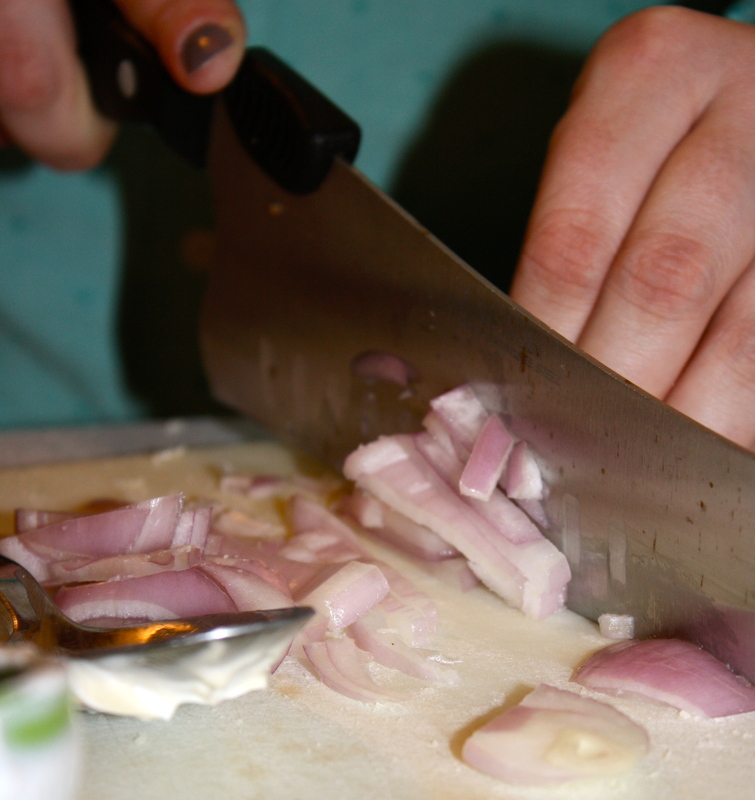 This is the most tedious part of the whole dish, but please make this….it’s definitely worth it. I promise!! Combine lime rind, remaining 1 tablespoon lime juice, sour cream, milk and avocado in a blender or food processor; process until smooth. Finally, it’s time to assemble (and EAT!) the tacos. Layer tortillas with chicken, slaw and avocado cream. Then, get to eating. I promise you won’t regret it! Heat tortillas by wrapping in aluminum foil and placing in a 250 degree oven for 5-10 minutes. Divide chicken mixture evenly among tortillas. Top each tortilla with about 1 tablespoon avocado mixture and 1/4 cup slaw mixture. This soup. I don’t even know where to begin. 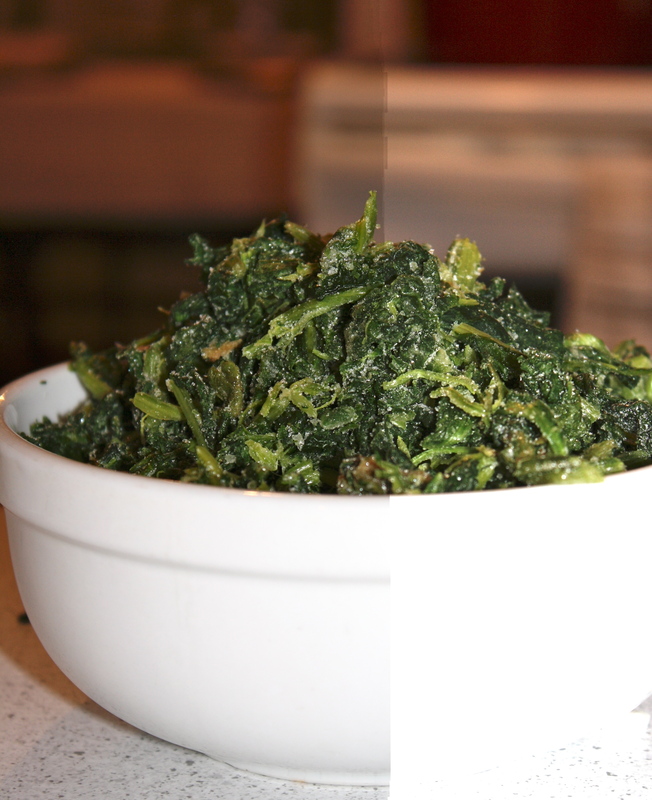 It’s absolutely delicious…and it has kale; so it has to be 100% healthy, right? 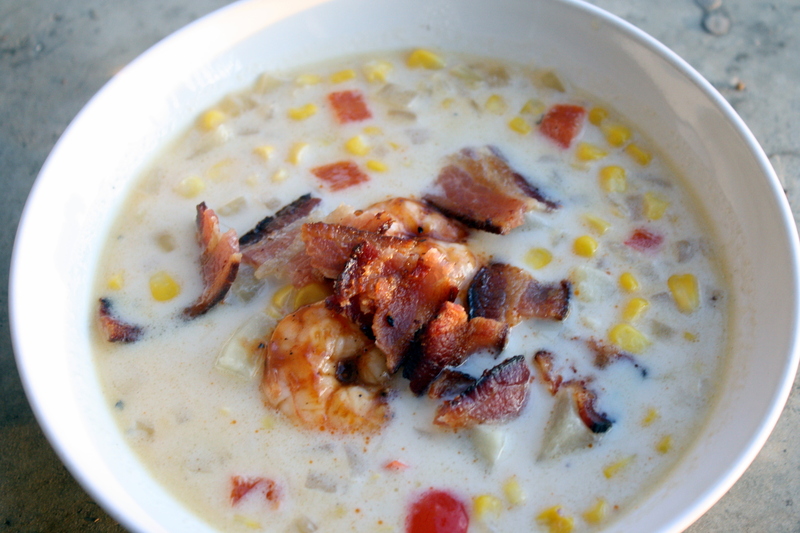 Maybe not….but at any rate, it’s better than many other dishes! 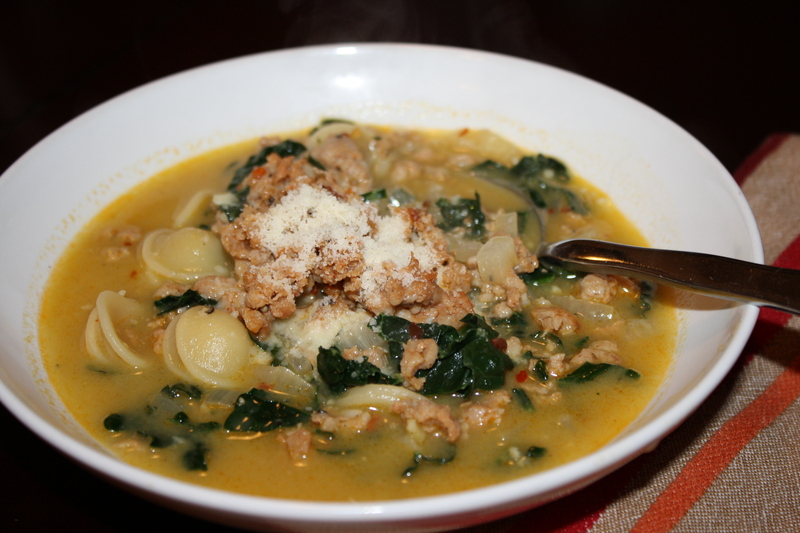 What is there not to love about spicy chicken sausage, pasta, kale and Parmesan cheese? Oh yeah, AND red pepper flakes. To me, it is the ultimate. After we first made this recipe, I sent it to my mom to try. She immediately made it for she and my dad. Now, let me preface. My dad is not what I would consider a “healthy eater.” He’s not big on salads as a meal, and would rather eat a nice big bowl of pasta or a juicy burger if he was going out to eat. “Soup” and “Kale” are not typically at the top of his vocabulary. My mom said he raved about this soup. He talked about it for days and asked her to make it again. You know that means it’s a good soup. We have loved it, and we hope you will as well. 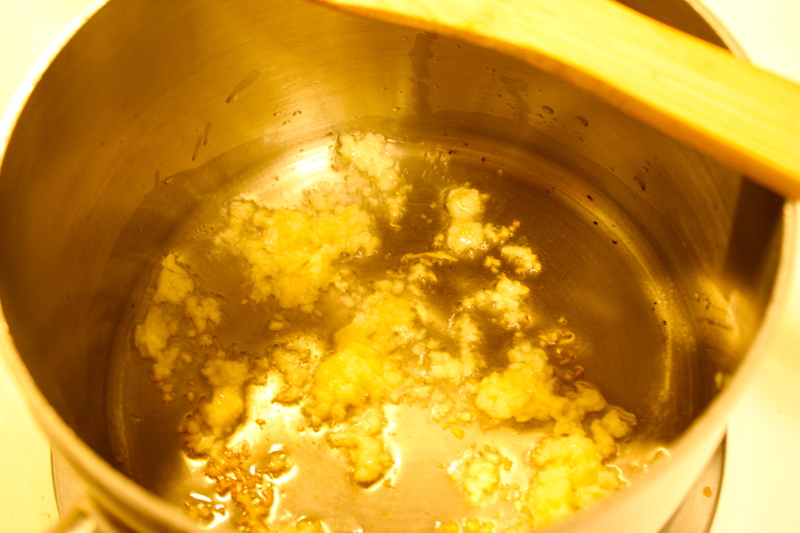 Heat a large pot over medium-low heat and add the olive oil. Add the onion with the salt, pepper and red pepper flakes and stir. 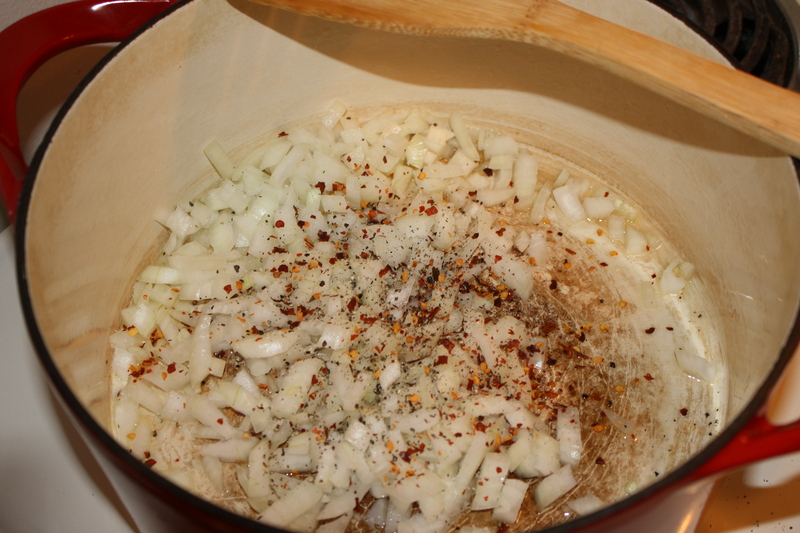 Cook until onions soften, about 5 minutes, stirring occasionally. Add in the garlic and cook for 1 more minute, then add the chicken stock, increase the heat to medium-high and bring the liquid to a boil. While the stock is heating up, heat a large non-stick skillet over medium-high heat. 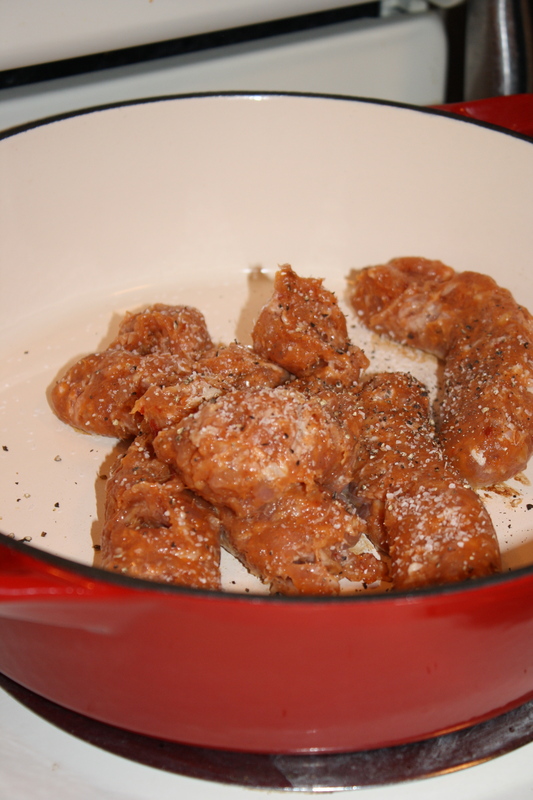 Remove the sausage from the casing (if it’s in casing) and add it to the skillet with a pinch of salt and pepper. Cook until the sausage is browned, about 6 to 8 minutes, breaking it into smaller pieces (or whatever size you desire) with a wooden spoon. Turn off the heat. When the stock is boiling, add the pasta and cook for 8 to 10 minutes, just until it’s al dente. Add the kale and stir well, cooking for 2 more minutes. Stir in the cheese, then taste and season with more salt and pepper if desired. 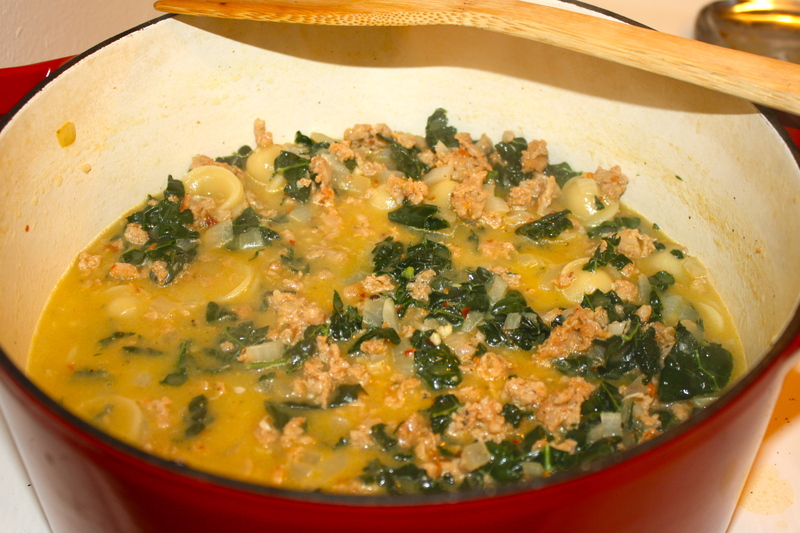 You can add all of the sausage into the soup or serve the soup into bowls and add the sausage on top per serving. 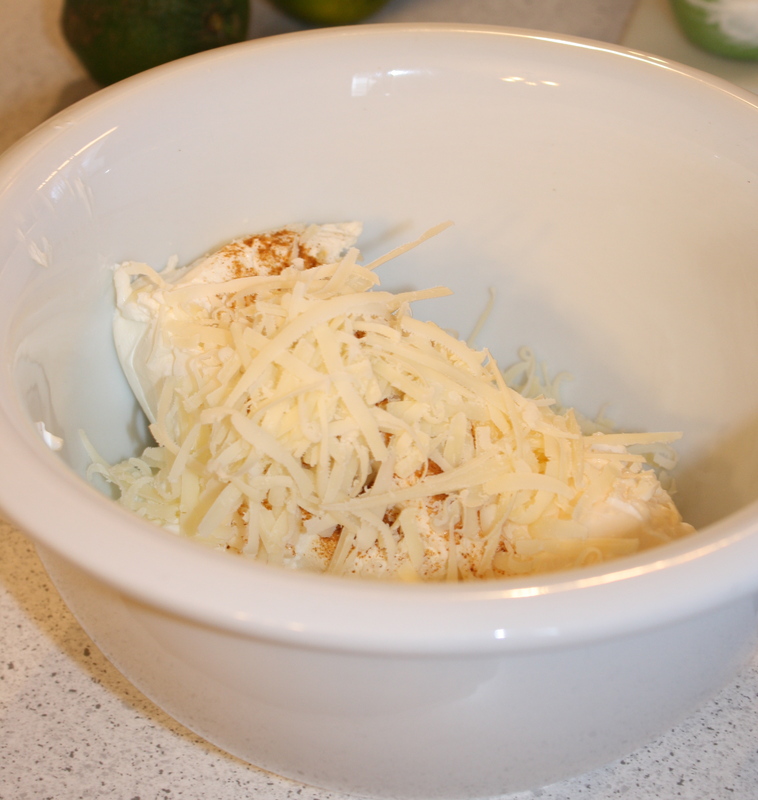 Serve with extra cheese for grating.